There are situations when you want the template inside the slot to be able to access data from the child component that is responsible for rendering the slot content. This is particularly useful when you need freedom in creating custom templates that use the child component's data properties. That is a typical use case for scoped slots. 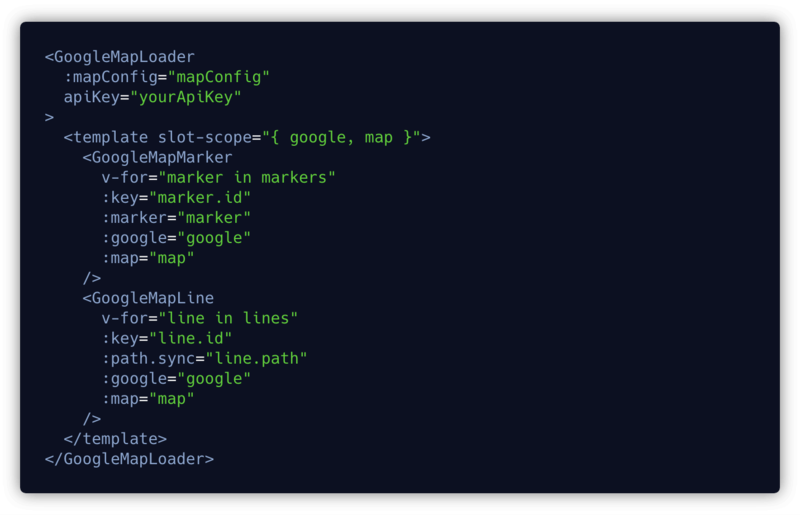 For the purpose of this blog post, I’ve created a component (GoogleMapLoader.vue) that initialises Google Maps API, creates a google and map objects and exposes those objects to the parent component in which the GoogleMapLoader is used. See below a basic example of how this can be achieved. We will analyse the code piece by piece and see what is actually happening in the next section. This is just part of a working example, you can find the whole example in this Codesandbox example. We will analyse the code piece by piece and see what is actually happening in the next section. 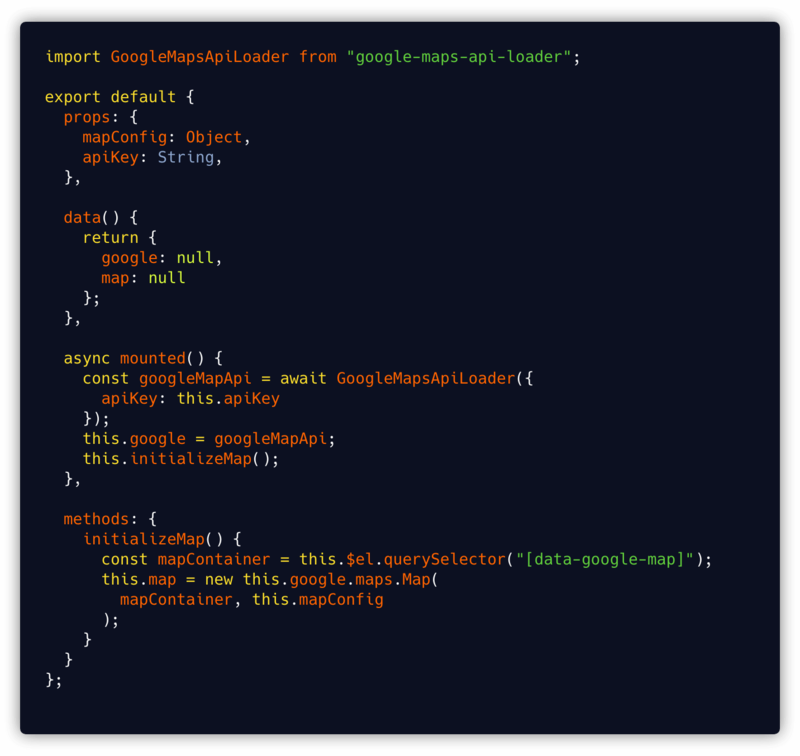 In the template we create a container for the map which will be used to mount the Map object extracted from the Google Maps API. So far so good, with that done we could continue adding the other objects to the map (Markers, Polylines, etc.) and using it as a ordinary map component. 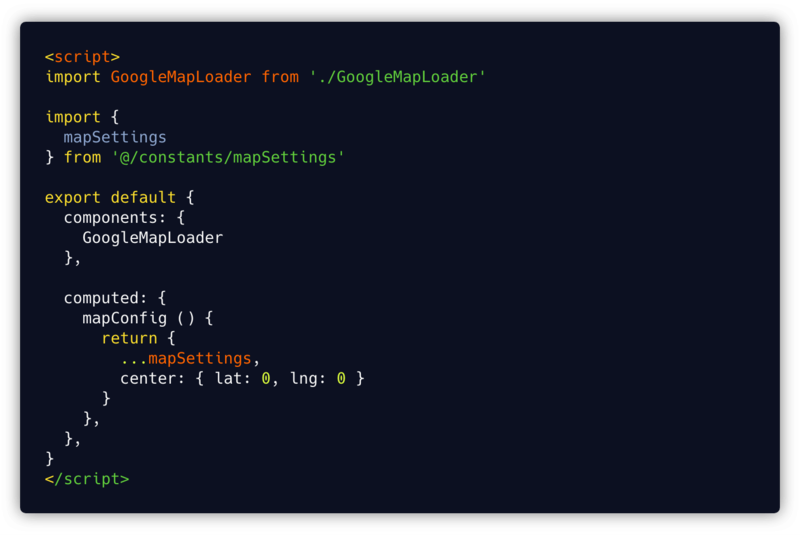 But we want to use our GoogleMapLoader component only as a loader that prepares the map, not renders anything on it. To achieve that we need to allow parent component that will use our GoogleMapLoader to access this.google and this.map that are set inside the GoogleMapLoader component. That's where scoped slots really shine. Scoped slots allow us to expose the properties set in a child component to the parent component. It may sound like an inception, but bear with me one more minute. 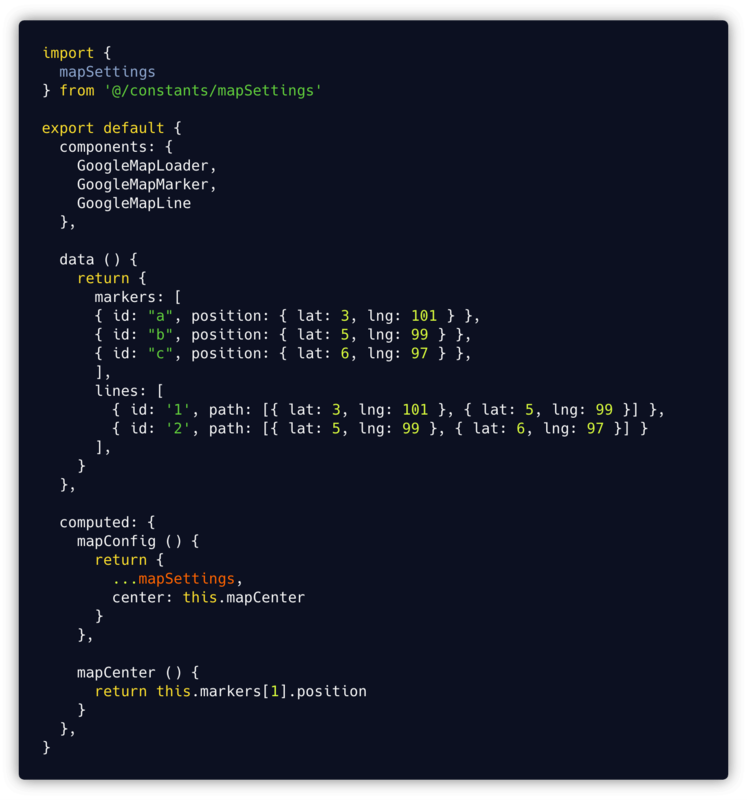 In the template, we render the GoogleMapLoader component and pass props that are required to initialise the map. Our script tag will look like below at this stage. Still no scoped slots, let's add one. So finally we can add a scoped slot that will do the job and allow us to access the child component props in the parent component. We do that by adding the <slot> tag in the child component and passing the props that we want to expose (using v-bind directive or :propName shorthand). It does not differ from passing the props down to the child component, but doing it in the <slot> tag reverse the direction of data flow. Now when we have the slot in the child component we need to receive and consume the exposed props in the parent component. To receive the props in the parent component we declare a template element and use slot-scope attribute. The attribute has access to the object carrying all props exposed from the child component. We can grab the whole object or we can destructure that object and get the required props. Let's proceed with the second option. 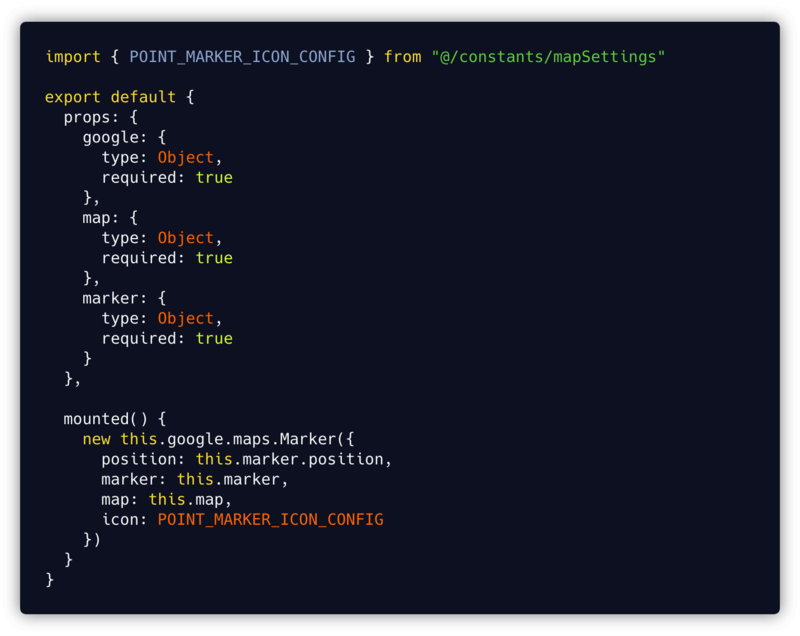 After doing that even though the google and map props does not exist in the TravelMap scope, the component has access to them and we can use them in the template. Yeah, ok, but why would I do things like that, what is the use of all that? Scoped slots allow us to pass a template to the slot instead of passing a rendered element. It’s called a “scoped” slot because although the template is rendered in the parent component scope, it will have access to certain child component data. 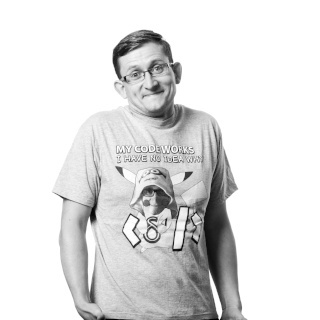 That gives us a freedom to fill the template with custom content from the parent component. Now let's use our factory components to add elements to our map. To add elements to our map we render the factory component and pass the google and map objects. We also need to provide data required by the element itself (in our case marker object with position of the marker and path object with polyline coordinates). In our script we need to import the required factory components and set data that will be passed to the markers and lines. That's it. With all those bits and pieces created we can now re-use the GoogleMapLoader component as a base for all our maps by passing different templates to each one of them. Imagine that you need to create another map with different Markers or just Markers without Polylines. By using the above pattern it becomes very easy as we just need to pass different content to the GoogleMapLoader component. 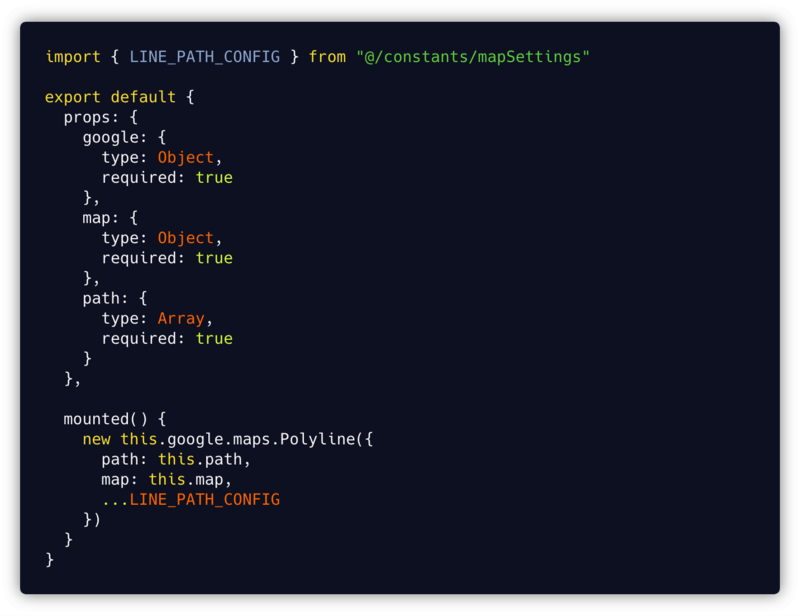 This pattern is not strictly connected to Google Maps, it can be used with any library to set the base component and expose the library's API that might then be used in the component that summoned the base component. It might be tempting to create a very complex solutions based on the example, but at some point we can get to the situation where this abstraction becomes an independent part of the code living in our codebase. If we get to that point it might be worth considering extraction to an add-on.